Same day dispatch before 3pm Monday - Thursday (1pm Friday). Need it in a hurry? 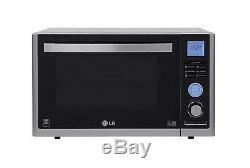 LG MJ3281BCS Solar Series Combination Microwave Oven. This microwave from LG provides multi-functional cooking, allowing you to preheat, brown, bake, or roast - all in significantly less time. The Charcoal Lighting Heater in this Lightwave oven gives more natural cooking results in lightening time. This unique form of cooking keeps food moist, tender and bursting with flavour. Use for speed cooking, as a conventional oven, as a grill or as a microwave. Perfect when there is only space for one oven in your kitchen or for overflow cooking like Christmas. Active Convection provides even cooking. This is enabled by four heaters evenly placed in the microwave for wider, fuller, more complete and even cooking. Energy saving is enabled in which the speed of the convection fan and heat of the grills are adjustable, enabling heat to penetrate food more deeply and evenly. This microwave also features 6 cooking modes. The new Lightwave system includes adjustable grill temperatures of low, medium and high, and adjustable fan speeds of low, medium and high. These variations create 6 unique cooking modes. The Easy Clean Coating provides a special finish that prevents stains from seeping deep into the interior coating, making cleaning over 10 times easier compared to other brands. Simply clean the toughest of stains with plain water and a few wipes - no detergent needed. This multi-function microwave from LG features microwave, grill, convection, and steam cooking to meet all your cooking requirements. This microwave also features 6 cooking modes, 4 auto defrost levels, & a steam cooking programme, giving plenty of options to choose from. With a generous 32 litre capacity, 900 watt power output, and 5 power levels, this microwave has plenty to offer. The charcoal lighting heater is great for cooking the perfect jacket potato, juicy roast chicken, luscious lasagne, and even frozen pizzas. For added safety, this microwave has been fitted with a child lock. Charcoal heater - high power density and fast response time. We are a genuine family run business established for over 30 years. We are UK based and VAT registered. If we don't have it in stock, we won't list it! We are committed to outstanding customer service. We have a dedicated customer services team who you can speak to if you have any questions. Thank you for taking the time to look at our listing. This item is graded and comes boxed with instructions and covered by our guarantee. In some cases, it can be hard to distinguish a graded stock item from a new one. We put all products through an exhaustive refurbishment and quality control programme in our factory. We correct any technical faults so that it functions like new and we test it to ensure that any remaining imperfections are purely cosmetic. We will only offer an item for sale to our customers once it has been thoroughly tested in this way and we are completely satisfied that it functions as it should. A graded item can cost substantially less than the same item brand new. A graded item functions like new, but is not brand new and will not be perfect. All products are electrically checked, tested and repaired by our factory. If in the unlikely event a product arrives damaged by the carrier or faulty we will replace the item FREE of charge. The item "LG MJ3281BCS Solar Series Combination Microwave Oven" is in sale since Wednesday, October 31, 2018. This item is in the category "Home, Furniture & DIY\Appliances\Small Kitchen Appliances\Microwaves".